I’ve been dreading this afternoon for weeks. Four weeks, to be exact. 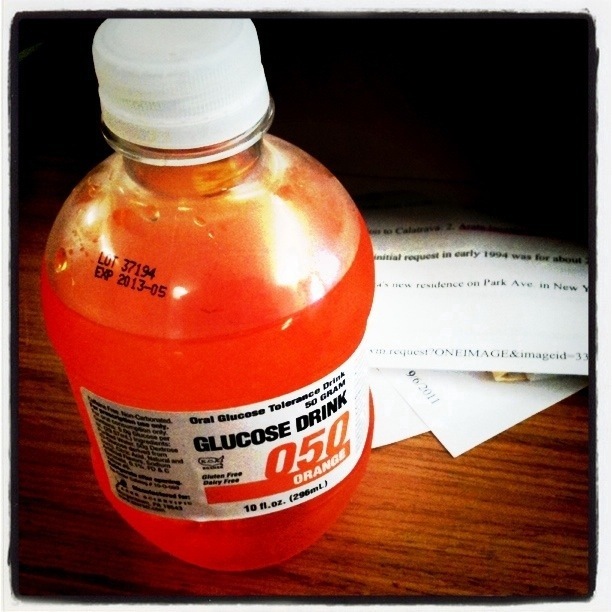 At my last appointment I was handed this little orange elixer and told to drink it 1 hour before my next appointment so they could test me for gestational diabetes. The nurse also recommended refrigerating it so it wouldn’t taste as horrible. So for the past four weeks, every time I’ve opened the fridge and come face-to-face with that little bottle I’ve grown more and more apprehensive about consuming it. I imagined it tasting like cough syrup and me gagging and not being able to keep it down. Fortunately, all my dread and worry made the drink taste like candy in comparison to what I was imagining. It just tasted like orange drink (you know, that old school drink you used to get at McDonalds. Is that still around?) not something I would voluntarily drink, but certainly not worth gagging over. Now that that’s done I’m just praying for normal results. The highlight of my visit was, of course, hearing the baby’s heartbeat. 153 beats per minute! That’s faster than the past two visits, probably from all the sugar I had just chugged. That little fuzzy part at the end is a kick! It is always so amazing to hear the heartbeat. I’ll never forget that feeling of surprise, happiness and awe that came over me the very first time we heard it. *I shake my fist at WordPress for not letting me embed a simple audio player. Hearing the hearbeat of my first grandbaby brought tears to my eyes!